Hi there! Welcome to the second day of the May Neat & Tangled release countdown! All of the new products will be available in the Neat & Tangled Store on Friday May 5th at 8:00 am EST! The stamp set I used on my card today is called Art Deco Background and it is filled with fun designs and some great sentiments too! So for this card, I first stamped the largest stamp which is the the gray lines you see. Then I stamped the triangles in some fun bright colors. I used the lines from the background stamp to help line them up. I stamped the square in the center for a focal point and background for my sentiment. I stamped the big "you" with Versa Mark and embossed with white embossing powder. It was cut out with one of the banner dies from the Scalloped Dies collection. I adhered that to the center of the card with foam tape, then stamped the rest of the sentiment underneath. I colored in the little squares at the corners with a pink Copic marker and then added a little dot of Black Nuvo Crystal Drops to them. I also added tiny black dots along the top and bottom of the pink square. You've showcased the versatility of these new stamps perfectly, Kay! Such a vibrant, striking geometric delight! LOVE this! Wow! Amazing card!!! Beautiful colors and design!!! Wow! You make such creative designs, and I love this one. So vibrant, I love the art deco look you've created. Way cool! Fabulous card Kay! Love it! I love the design of this pretty card!! Lovely. Oh how cute and fresh! Your design is fantastic, and it appears your inks stamp wonderfully, Kay ... care to share your source? I adore this card! The colors are so bright and happy, and I like that you turned the large stamp at an angle. Gorgeous card. I love how you stamped the triangles. What a great design and choice of colors!! Love your card, Kay! The Art Deco Background is fantastic!! This is absolutely stunning! 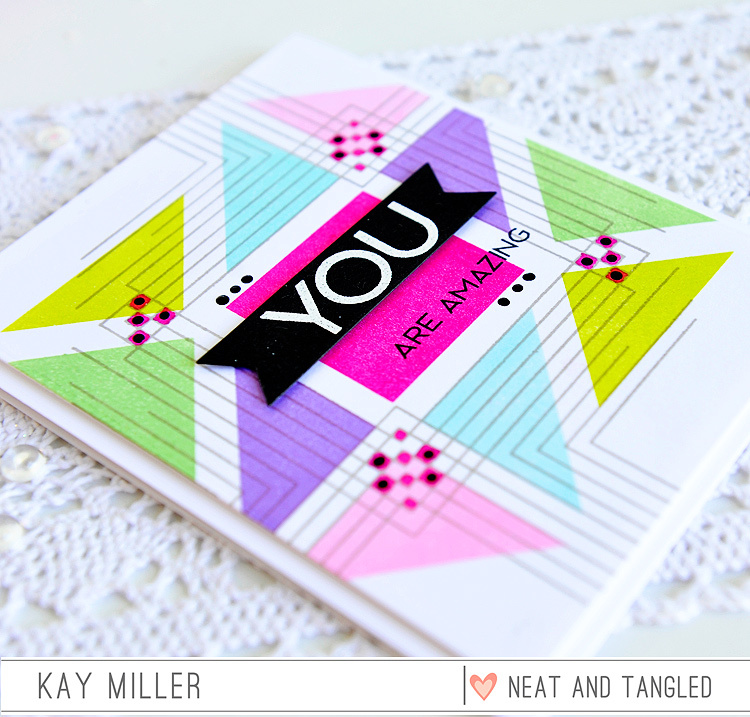 The colorful triangles make this card pop! Boy this is a stunner. Love that background and the wonderful colors you chose. Great stuff at Neat & Tangled. This design is gorgeous. I love the colors in the design. The design could be used for many different occasions by changing the color scheme. This is so COOL!! 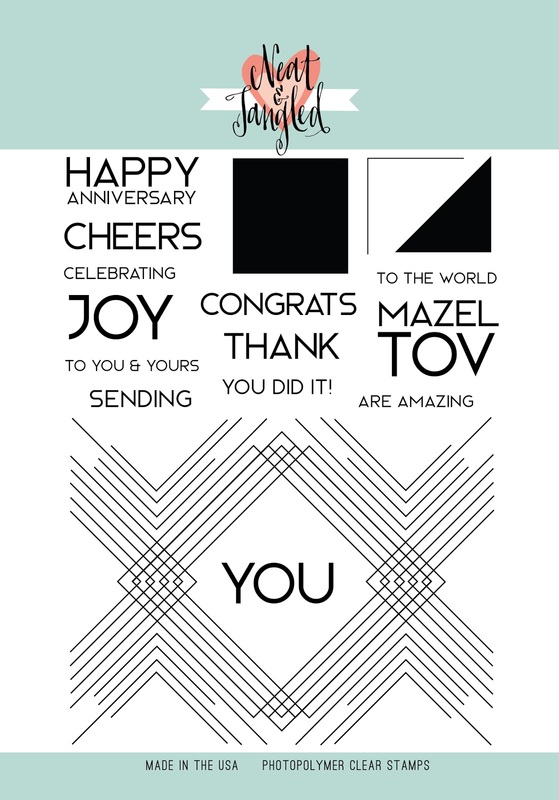 I love the graphic appeal of your card and the fun way you used color. Really neat card. 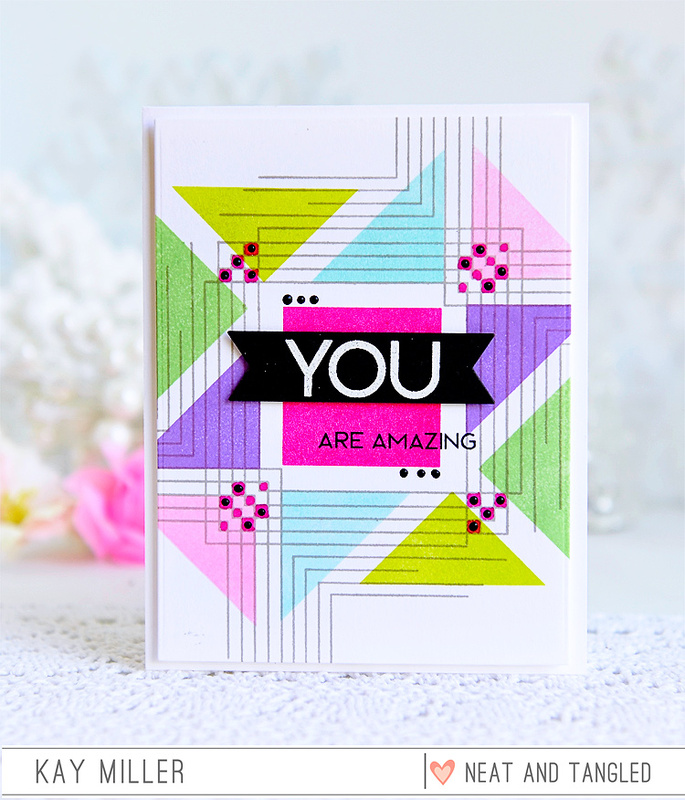 Every card using this set in this blog hop has been used and colored so different! And yours is so bright and happy and coloring those little corners just adds so much! My hats off to your creativity it's inspiring! Thanks for sharibg! Love the bright colors on your card, it is so cheery! I really like how you combined the background with the triangles. Thanks for sharing your talent! Love this fun and colorful graphic background. Love your card and the colors are great! 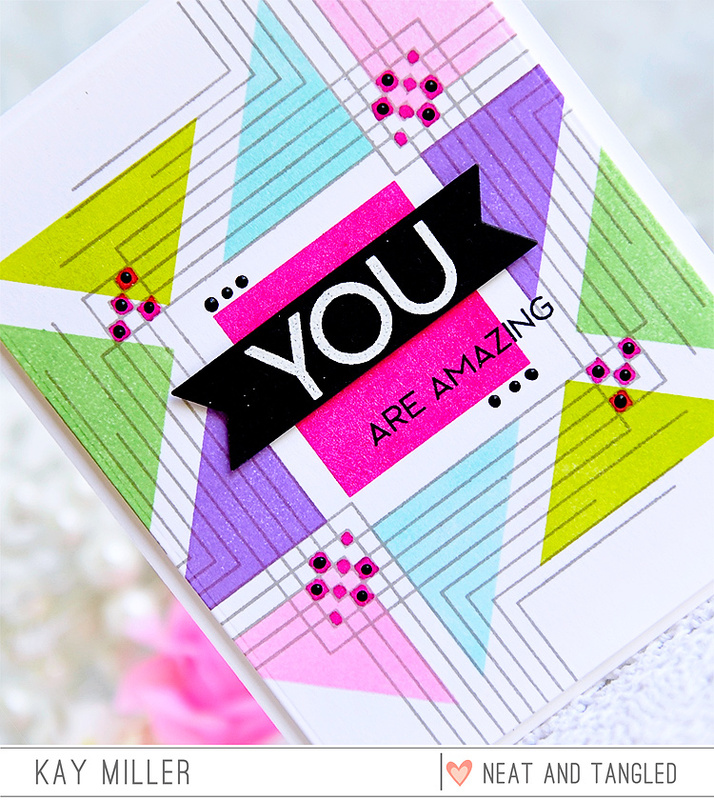 I seriously plan on making this exact card, I love how you turned the background 45 degrees, and used the design as a guide for the triangles, the result is absolutely fabulous! Holy cow, this card is amazing. I HAVE to get this set because I've seen that the sky is the limit! Thanks for sharing, great job!!! Another bright and cheerful card. So inspirational. OMG! When I saw this stamp set, I wasn't too thrilled with it. But, now that I've seen this card - I gotta have! LOVE this 'Art Deco' pattern and the colors you chose are really fabulous, Kay! 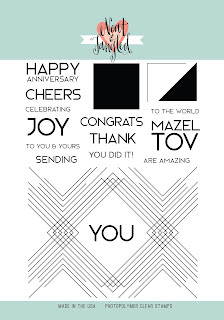 Your B&W embossed sentiment really pops on this card, too...I love it! Love what you created with these sets! Great colors! Lots of possibilities with this Art Deco set! I just love how you've used this set! And the colors you have chosen - Oh my, just beautiful! Love how you stamped this. It looks like a totally different stamp. Really nice.